Housed on the second floor of Elon College’s original Main Building was a one-room library and reading room, the first library on campus. The infamous fire on January 18, 1923, destroyed this room, along with most of the college’s library collection. But more than just books were lost that day; irreplaceable records of both Elon College and the Christian Church of the South, Elon’s parent denomination, were lost. A free-standing library was among the five new buildings planned to replace Main Building. The Carlton family of Richmond, Virginia, donated the funds to build the new library. On June 22, 1923, less than six months after the fire, ground was broken for the new library, which would be located next to Whitley Auditorium. Carlton Library was dedicated on September 27, 1924. The architect was Mr. Herbert M. Hunter, and the general contractor was Joe W. Stout and Company. In attendance were members of the Carlton family. The patriarch of the family, J. W. Carlton, was unable to attend due to age and infirmity, but his children—Pleasant Joseph Carlton, Luther Eugenius Carlton, Herbert Anderson Carlton, and Nannie Carlton Parrot all attended the ceremony and were photographed in the new reading room. According to the Souvenir Library Bulletin, “September 27 will go down in the annals of Elon College as a great and memorable day. 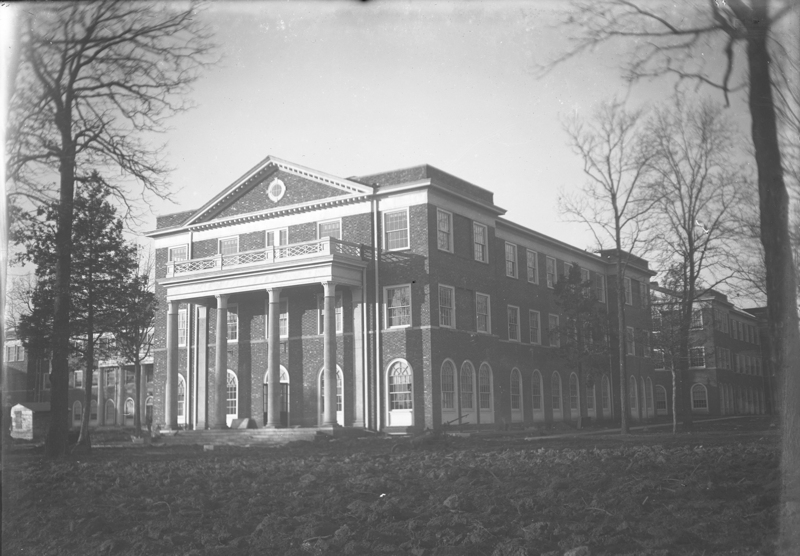 On this day the Carlton Library Building was presented to the College by the family of Brother J. W. Carlton of Richmond, Va. and dedicated to its high holy purpose of service to the cause of Christian Education through books.” The Southern Christian Convention, the governing body of the Christian Church, made the new library the repository for its records. The three-floor library cost $100,000 to build, a considerable fortune in the 1920s. One of the most important features of this new building was a three-story fire-proof vault that contained steel stacks for a book collection of about 65,000 volumes. In addition, Carlton’s stacks were closed, which meant that students and faculty couldn’t browse the shelves. When a student or professor wanted to look at a book, they had to request it be retrieved by a member of the library staff. Prior to the fire of 1923, the one-room library in Main Building had been managed by a member of the college faculty who served as the “Curator” of the library. When Carlton opened, it was staffed by professionally trained librarians. Louise Savage was the first Head Librarian and was also Elon’s Dean of Women. The first floor of the library contained the ground floor of the fireproof vault/stack room, along with offices for the librarians and a cataloging room. The remainder of the first floor was the library’s reading room with seating for 96 students, as well as reference books and periodicals. Interestingly, for many years Carlton’s reading room was actually divided into separate reading rooms for male and female students. It is hard to imagine such rules at Elon today, but at the time, the two areas were divided by a large desk for the librarians, as well as a card catalog in the center of the room. In keeping with the strict social conventions of the day (not to mention the rules of the church-affiliated college), young men and ladies weren’t allowed to mingle or socialize during visits to the library. College students have always been creative, however, and the Elon students of old were no exception. They found a way around this prohibition. According to the late Ted Perkins, a former librarian at Elon, the card catalog that separated the men’s and women’s reading room had drawers that could be pulled out from either side. Since the boys and girls weren’t allowed to mingle during their visits to the reading room, they would use the drawers of the card catalog to pass notes to one another! Carlton Library was the college’s library for over forty years, from 1924 to 1968. It was a part of college life for several generations of Elon students. However, as time passed, Elon outgrew the library, and it became inadequate for the needs of the college. After the library collection was moved to the new Iris Holt McEwen Library in 1968, Carlton was used for a variety of purposes. In 2002, the building was completely renovated to hold the Isabella Cannon Center for International Studies and El Centro Spanish Language Center. This entry was posted in Academics, Campus buildings. Bookmark the permalink.